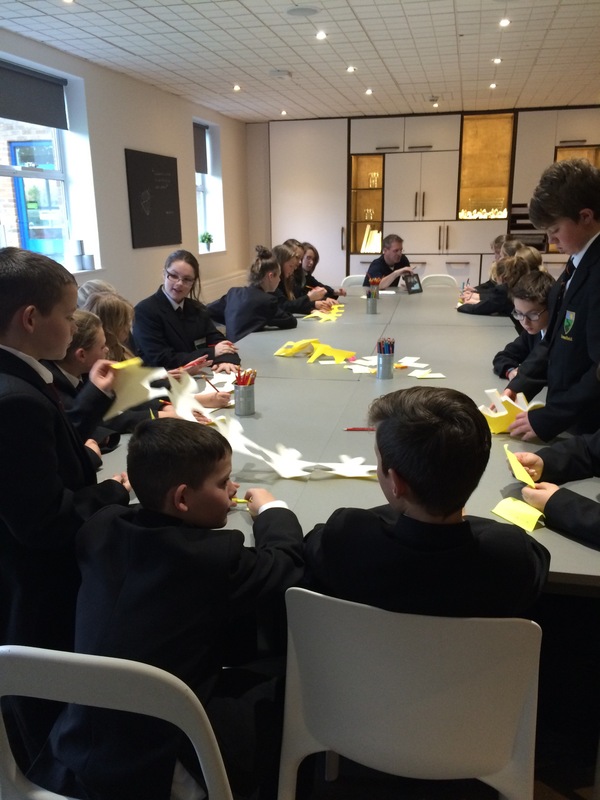 I was very excited to see some of our year 7 students from the Sunnydale Campus and Aycliffe site come together and join us for a reflective afternoon. It was important to hear their ‘Greenfield Experience’ and views since we worked together in the summer. They are such a nice lot and I think they were looking forward to all catching up. As part of the afternoon we had some of our colleagues from The Netherlands come to visit. They were keen to see thinking skills, student enquiry and SOLEs in action. The discussion was great. We talked about the differences and similarities between us and animals, evolution and the ability to have choice and be the kind of Human you’d like to be. We then met Dora. 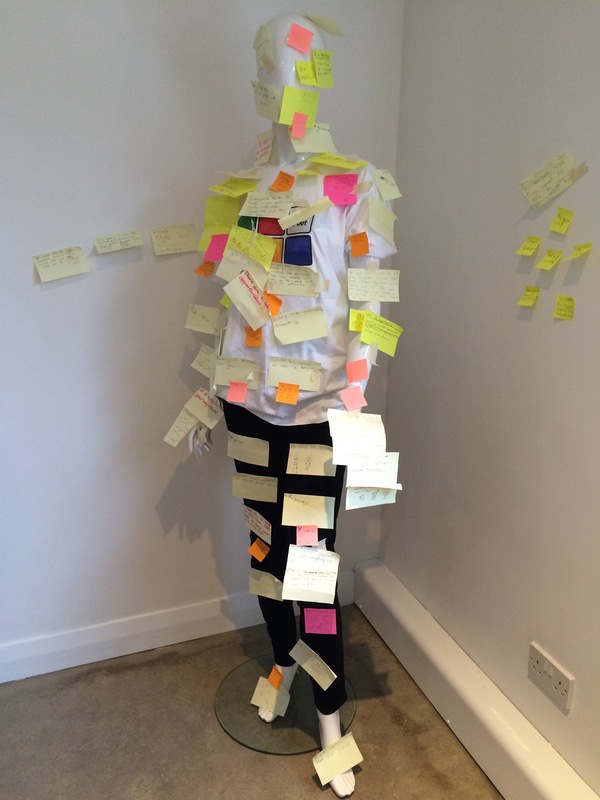 She’s our mannequin and wanted to know the great greenfield experiences and advice the group had. The year 7s also thought about the ideas they’d considered in the SOLE and think about the skills, strengths and areas for development they bring to make Greenfield the place it is. They created this using our paper people chain. They looked beautiful publicly displayed in the Arts Centre afterwards. It was wonderful to share the afternoon with are visitors, share ideas, insights and challenges. I’m looking forward to following this up during a visit there in Jan 2016! We were invited to attend and to speak at the inspirational ‘Great North Greats’ Conference on the 1st October as part of the Great North Run Culture Programme. They were interested to hear form the Engine Heads about our research into SOLEs and how this is challenging teaching and learning. The conference featured many incredible people who have made extraordinary things happen in the North East. The speakers either worked in the North East of England, were born here, came to live here or simply believe that the North East is a place of fantastic innovation and creativity. We heard from world class scientist Danielle George, Olympic Volley Ball Champions Peter Bakare and Nathan French and Shadow Culture Secretary Chi Onwurah amongst others. I really enjoyed ,Director of Great North Run’s Culture Programme, Beth Bate’s talk about the power of Arts and Culture in our region. It was really uplifting. We were delighted to have the opportunity and share the stage with Professor Sugata Mitra and talk about our involvement in SOLE and the changing face of education. The Engine Heads, Mille, Lucy R and Alfie did a superb job of sharing their insights and experience with over 250 delegates. They are so passionate about learning and this really came across. I was very proud of them. Students from both our Sunnydale Campus and Aycliffe Site did us proud as delegates who show ambition, curiosity, creativity, dedication and passion about making things happen. What a great bunch.